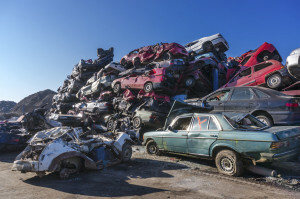 Insurers are likely to declare more cars repairable than total losses this year, a Mitchell analyst estimated Thursday. 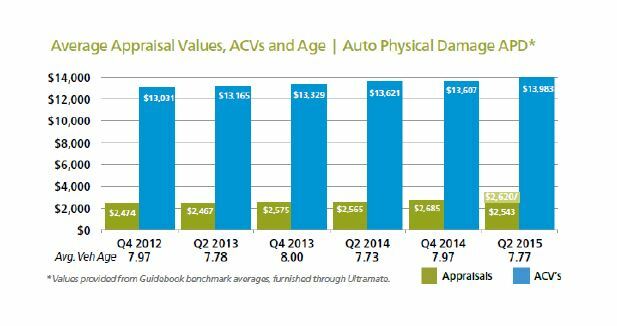 Greg Horn presented findings from the Mitchell third-quarter Industry Trends Report indicating the average age of a vehicle in the claims process between April-June was roughly equivalent to that in the second quarter of 2013, 7.42 years to 7.41, respectively. However, the actual cash value rose to a new high of $14,794 in 2Q 2015, which is far ahead of where inflation would’ve put it. “That overall is good news for the collision repairer and the insurer,” Horn said during Thursday’s webinar, referring to the likelihood that vehicles will be fixed instead of totaled. Average claim value was projected to be about $2,884 using a Mitchell algorithm which estimates supplements to the quarter’s repairs done after June 30. “This is truly a lottery of what your insured customer hits,” he said, rather than influenced by the nuances of a first-party portfolio. Even though the cash values on third-party claims are about $2,000 less, it’s still “a lot of money” for a third-party car at $13,983, Horn said. Paid losses were also “up significantly” from the second-quarter of 2014, at $2,620 using the supplement algorithm versus $2,565 last second-quarter, according to Horn. “I think we’re going to repair more vehicles than total out vehicles in this year,” he said. Horn also had some interesting analysis of parts use in the industry, as well as a point about the potential assistance collision repairers could lend on a notorious component: the Takata airbag assembly. Here are three other highlights from the webinar. Asked during a Q&A period about the impact of OEM collision parts programs like Conquest, Horn said Mitchell “absolutely” sees a reduction in the percentage of the bill dedicated to parts. When OEMs like Ford and GM expanded the number of parts up for price matching in recent years, “we instantly saw” reductions in both parts costs and OEM parts costs, according to Mitchell. “We do see an impact there,” he said. Given that, it’ll be interesting to see what impact Mitchell and competitors track once GM’s MyPriceLink goes online via OEConnection. True Opt-OE parts — ones sold through the OEM or an approved third-party vendor — aren’t really a big segment of collision repair parts usage right now, based on Mitchell’s findings. Asked about their impact, Horn said Mitchell can track Opt-OE, but it hasn’t reported that information publicly. “It is not a big population of parts,” he said. Horn noted that the record number of auto sales these days reduced the chance overstock parts would be available. “Those parts that are produced by the subsuppliers go to the assembly line and to the OEs directly,” he said. Asked for his take on the Takata airbag assembly recall and vehicle values, Horn said there could be an effect, but that he hadn’t studied this specifically. However, he first offered an interesting digression about the giant backlog of vehicles awaiting replacement parts, which he said wasn’t the only complication of completing the recall of 10 percent of the entire U.S. fleet. “Not only do we have a parts shortage, but we also have a service drive shortage of airbag-capable technicians,” he said. The answer to the latter was simple: Contract out to collision repairers. He also raised another possible point where greater flexibility might be considered. A friend on the recall list asked his service provider what he should do while waiting for the replacement parts. Their advice was simply,”‘Just don’t get in an accident. '” But despite this less than ideal answer, they wouldn’t disable the airbag as the friend requested, according to Horn. “‘I’d rather have no airbag than a projectile thrown at me,'” was the friend’s rationale, according to Horn.